Looking across my classroom, at the brown and blond heads hunched over an assignment, Dr. King’s powerful words resonate with me. Yet, even fifty years later, we are still working on fully bringing his dream to fruition. At many traditional public schools across the country, students are segregated based on their zip code. This was especially true of the high school I attended, where the homogenous student body was mainly white and upper middle class. Not so at Blackstone Valley Prep (BVP) Mayoral Academy. One of the reasons I chose to work at BVP was our organization’s intentional diversity. BVP draws students from four different communities, and our scholars come to us from a variety of backgrounds and with vastly different experiences. At BVP, you truly do see scholars of all races and ethnicities learning and working together and treating each other with respect. I am proud to be a part of an organization committed to such a mission. 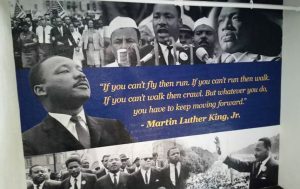 Tomorrow, in my class, we will celebrate Dr. King: his vision, his courage, and his impact on our lives. We will discuss how BVP might not have been here today without his work. As the week goes on, we will discuss our own dreams for the future. And we will celebrate Black History Month in February, highlighting other leaders of color who have affected change in our communities and in our country. But we cannot and will not leave it at that. In my time here, I’ve realized that in order to truly live out Dr. King’s dream of equality and freedom, one day, one week, or even one month, isn’t enough. We need to do this work every day. This means creating a classroom culture where scholars feel comfortable sharing their thoughts, ideas, and experiences. It means empowering scholars to stand up for what they believe in. It means teaching history from multiple perspectives, and acknowledging that there is no single narrative of history, but a vast collection of stories and struggles. It means recognizing the injustices still present in our society, and taking steps to combat them, even in the 4th grade. It means teaching scholars that they can and should be movers and shakers. Most importantly, it means making a continuous commitment to pursuing positive change each and every day. Only then can we truly live out Dr. King’s dream. A wall featured in a stairwell at Middle School 1.